We sail mostly in the beautiful Bacuit bay which provides an excellent play ground with changing winds throughout the day. We do day trips to most islands and anchor near beaches for lunch break. The nature of the bay with its many islands provide us with many sailing challenges as the wind is deflected by the shores created by the many islands. If the wind is very strong and if there is swell, we can stay in the sheltered bay. If the sea is more mellow, we can venture out to get more wind. 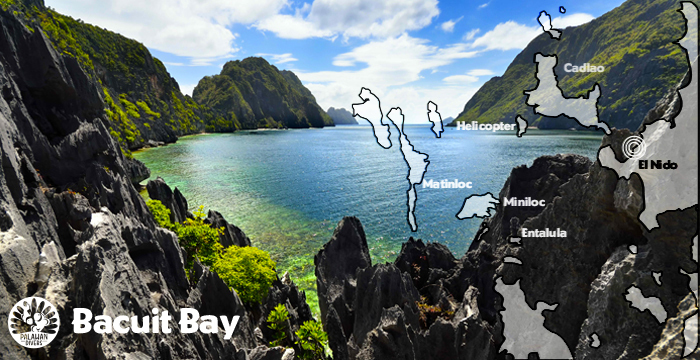 We can also easily reach the northern island of Linapacan within a day and anchor overnight. Since we have access to the South China sea and the Sulu sea, we benefit from several oceans conditions. The sailing seasons in Palawan are mostly dictated by the trade winds. These are the NE-Monsoon – Amihan, and the SW-Monsoon – Habagat. The Amihan season is from November till May, the Habagat season is from about June to October. The influence area of both of these prevailing wind systems extends for thousands of kilometers over the open ocean, the South China Sea for the Habagat and the East Chinese Sea and Philippines Sea for the Amihan. During the Amihan season we primarily get easterly winds, constant at about 10-15 knots with gust of 20 knots. During the Habagat season (the rainy season), the winds are not as strong and usually from a southerly direction tending westerly. It is best to come sailing in Palawan from late October to late May.